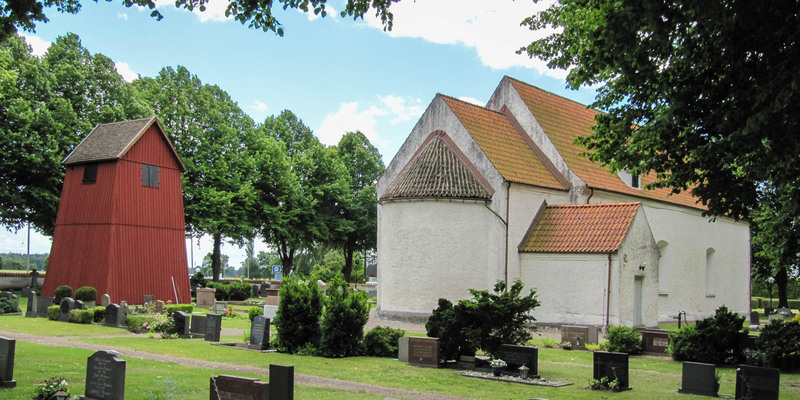 The church Gualövs Kyrka was built in the late 12th century. 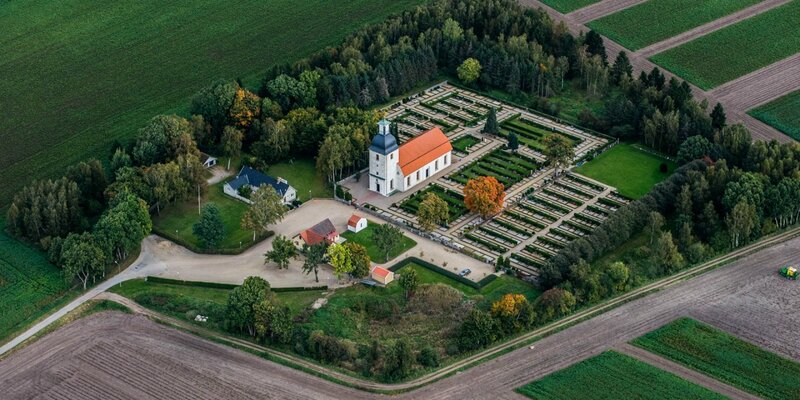 It is located outside of the village Gualöv, 5 kilometers west of Bromölla. 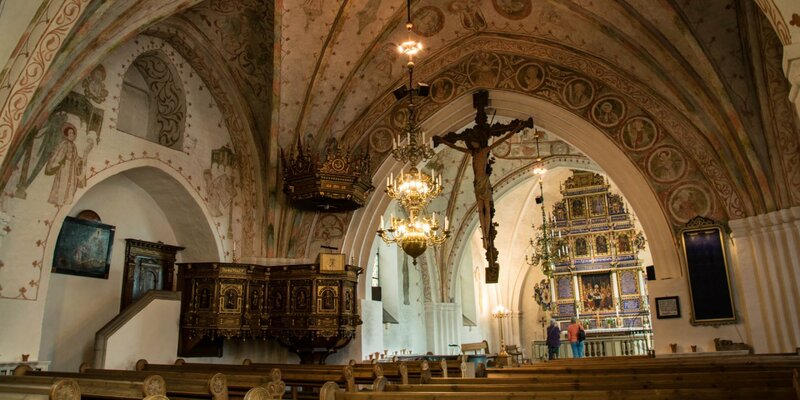 The original layout of the Gualövs Kyrka consists of a nave with a low recessed choir and a small apse. The external appearance of the church still corresponds largely to that of its edification. Only the church porch on the south side, the so-called weaponhouse, was added in the 15th century, and in 1833 the nave was extended by a few meters. 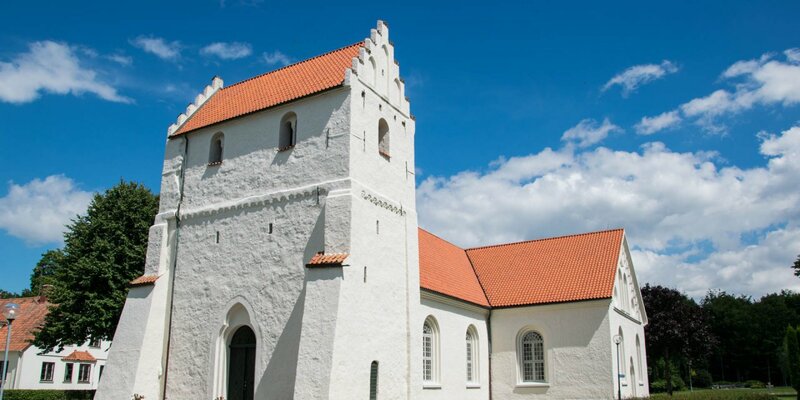 In contrast to most other churches in Skåne, which usually received a church tower, this is missing at the Gualövs Kyrka. Instead, their church bells hang in a separately standing wooden steeple from the 18th century. As unadorned as the church looks from the outside, it is not from the inside. There are distinctive and very well preserved paintings on the ceiling vaults. Among them are relatively rare, well preserved Romanesque paintings from the 12th century, which are located under the triumphal arch between the nave and the choir. The church's inventory dates from the time after the Reformation. The pulpit and baptismal font, both furnished with canopies and created in the style of the late Renaissance, were built around the end of the 17th century. The wooden carved altarpiece with the crucifixion scene, flanked by Moses and John the Baptist, is a work of the sculptor Gustav Kihlmann from 1704. The oldest surviving item from the church is another carved crucifixion scene from the 13th century, which was located at the triumphal arch until the Reformation, and is now preserved in the Historical Museum in Lund.